We finished painting my little office and redoing the floor two weeks ago. It took a couple hours to move everything back into the room. I spent a week organizing, washing all the storage containers, and doing a final purge once I got everything moved back. I let things rest a week to see if anything else needed done. I'm comfortable that my office is finished. I’m really happy that the Oops paint that we used looks good with the décor that I already had. My office is small ab...out the size of a walk-in-closet. 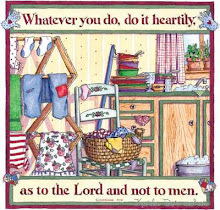 I’m blessed to have my own pretty space to do my craft projects and plan my homemaking chores. I still have a stack of magazines to go through but I'll always have a stack. I’m really proud of the fact that I have purged so much out of my little office. I purged enough that I didn’t put the shelf back over the desk window and had my husband remove a shelf from one of the bookcases. I no longer have crafting stuff stored in the basement. I do have my quilting supplies in the guest room closet but it’s organized and purged too. I’m thankful for the month long work my husband put into helping me redo my office. I had a vision of what I wanted to see when I looked into my little office and we were able to create it. I wanted a relaxing look that didn’t look as busy. Not putting up the shelf over the window was a big step to making that possible. I wanted to get rid of almost all of the craft stuff for children and make it my own now that our 4 children are grown.